In is with deep sadness and regret that verified reports of inhumane treatment by foreign forces and their hireling gunmen with defenseless inmates keep pouring out of Puli Chahrkhi, Bagram and other local prisons. At this very moment reports, videos and pictures have been received showing that hundreds of inmates are on hunger strike in the notorious prison of Puli Charkhi. It is said that the prison officials deal with the inmates in the most barbaric way possible. They are verbally abused, tortured, not given the allotted food or on time, are denied sunlight and basically, all their rights as prisoners are being violated. The inmates say that they had previously gone on hunger strike against this barbarity. The block warden named Arif promised that their problems will be resolved and dispatched a team to listen to our concerns. After our representatives talked to them, they were promptly called in by Arif to his office where members of NDS were also present. These men were handed over to the intelligence agency and have not been heard of till this very day. This comes as reports emerged that on the third month of the current year, a recently appointed warden Colonel Najmuddin is preventing inmates from reading the Holy Quran or studying any religious material. This colonel would put all the scholars who taught inmates into solitary confinement as well as beat and torture other inmates under various flimsy excuses. UNAMA had also published a report – based on interviews with over 200 thousand inmates – stating that inmates are treated inhumanely in the prisons of Afghanistan, confessions are taken under torture and this behavior (torture) towards prisoners has seen a 14% increase recently which violates humanitarian law. This abuse by the officials of the puppet Kabul administration has forced the hands of inmates into carrying out such strikes which result in martyrdom, bodily harm and development of mental illnesses. Last year an inmate – Hafiz Abdul Rauf – from Qarabagh district of Ghazni lost his life under torture and beatings in the notorious prison of Puli Charkhi. On top of the above, inmates face similar and in some cases even worse treatment in Nimroz, Sherbarghan, Helmand, Mazar, Kandahar, Ghazni and other provincial prisons. One of the most recent cases has been reported from Kandahar where the violator of humanitarian law and one of the most notorious warlords, Gen. Razziq and his men abducted 80 students of knowledge from religious seminaries. Some of the students were later martyred (their bodies found in barren deserts) while the rest are still missing. The relatives of inmates say that judicial bodies, judges and other high-ranking regime officials also demand huge bribes via intermediaries to get their loved ones released. And the destitute who cannot pay the large sums of money watch their next of kin helplessly spend years upon years in the dark prison dungeons. Due to the constant humiliating and inhumane treatment and the absolute helplessness of these prisoners, many are pushed to the edge where they inadvertently attack the prison guards. This (unarmed inmate engaging an armed ruthless guard without thinking about the consequence) in itself proves the worrying state in which these prisoners reside. 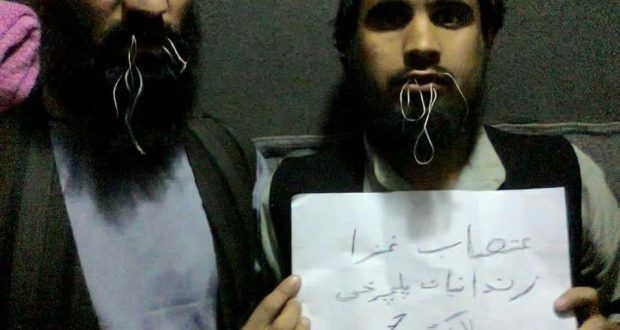 The Islamic Emirate has repeatedly called on the self-proclaimed mantle holders of human rights, UNAMA, ICRC, Amnesty International and others to take action but unfortunately human right violations and torture continues to be an endemic in the Kabul regime prisons.